Call us today at 519-972-6720! Windsor Ontario chiropractor Nathan Kruse DC at Dougall Chiropractic is one of the best chiropractors in the Windsor area specializing in chiropractic care and wellness. Dr. Nathan Kruse is a chiropractor committed to providing pain relief for many symptoms and conditions so that you can have a higher quality of life. Don't just take our word for it though; visit our testimonials page to see what our patients have to say. At our Windsor chiropractic office you will receive the best care through the use of modern chiropractic techniques and technology. Dr. Nathan Kruse and the staff at Dougall Chiropractic have a genuine concern for your well-being and health! Call us today and we can develop a chiropractic plan specific for you. To receive free wellness and health articles subscribe to our bi-weekly newsletter. If you are already a newsletter subscriber, please explore the member wellness section of our website for animated exercise videos, wellness articles, chiropractic resources, and health facts specifically targeted to your wellness needs and interests by Dr. Nathan Kruse. Dr. Nathan Kruse is a licensed Chiropractor serving the Windsor community. Dr. Nathan Kruse has been freeing people from pain in the clinic in Windsor, ON. As a Chiropractor with experience, Dr. Kruse is committed to promoting optimal health and well being of patients. Dr. Kruse uses a 'whole person approach'. This approach to wellness means looking for underlying causes of any disturbance or disruption (which may or may not be causing symptoms at the time) and make whatever interventions and lifestyle adjustments that would optimize the conditions for normal function. Using this unique approach, Dr. Kruse is able to help you to accelerate and/or maintain your journey to good health. 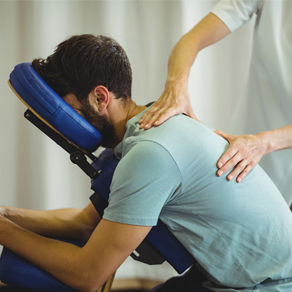 "Prior to coming in to Dougall Chiropractic I had ongoing headaches almost daily and my low back would hurt after sitting for more than 15 minutes. It affected my ability to work and do things around the house and I had tried physiotherapy and medications but they did not do much to reduce my pain. Within the first week of treatment with Dr Kruse I had almost no headaches and I could work around the house without anything more than a little soreness! By the fifth visit I had almost no pain and had only one minor headache in almost 2 weeks. No I am pain free and haven't had a headache in months! Thanks Dr Kruse!" "I am extremely active and with workouts I had been experiencing severe pain in the upper back and low back pain several times a week. After trying several things to help with the pain for almost a year I went to see Dr Kruse at Dougall Chiropractic. After my very first visit I could turn my head much easier and my midback felt great. Now I workout and stay active everyday and thanks to the adjustments by Dr Kruse I am pain free and only go in for maintenance adjustmets from time to time to stay that way! I would recommend anyone looking for answers for their pain to call Dougall Chiropractic and see Dr Kruse!" "I used to see Dr Kruse in Michigan and after he left to open his practice in Windsor I tried several other Chiropractors in Michigan but did not have the results I had with Dr Kruse. I travel almost an hour each way over the border into Canada once a month now and thanks to Dr Kruse I can function with much less pain and I feel so much better! I would recommend him to anyone and now my whole family see's Dr Kruse!"